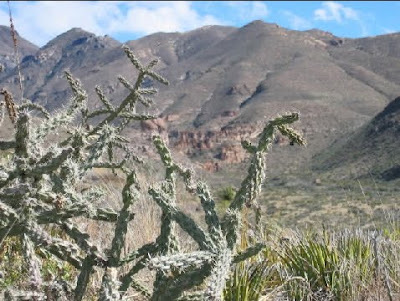 Welcome to West Texas and Big Bend Country in the Great State of Texas. Land of The Bluebonnets, Texas State Flower, which cover the Basins of the Mountains and Mesas in the spring after a winter of snow and an early spring of good rains. 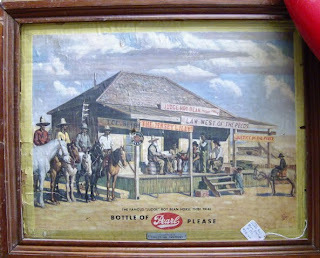 Judge Roy Bean in Langtry, Texas. 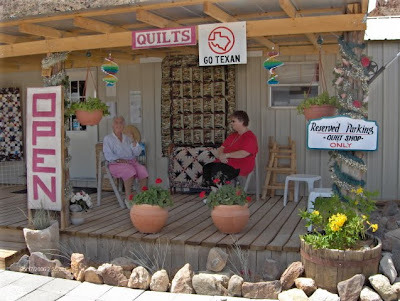 Yep, by now ya'll know this GirlRaisedInTexas can find a Quilt Shop in the most remote places, and the 'Terlingua Quilt Shop' is about as remote as you can get in Texas. It's an Oasis for the Quilt Thirsty Tourista's, and even when the temperature is in Triple Digit HOT, they buy quilts. How do I know this? Been There...Done That. Hi Sue...nice change from all the "pink hankie-pankie". It's about time. I was seeing pink! Nice pictures, especially the sunset. 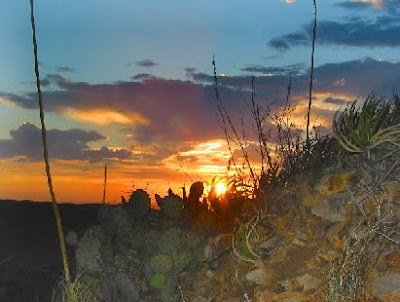 I have never been to Terlingua or very far into the Big Bend. Hope I can make it there some day! Great pictures. I would love to visit that quilt shop. As I told you before, both of my Grandmothers made quilts so I have a ton...but would buy just about every one I see if I let myself. Something so warm and safe about a handmade quilt. Beautiful pictures of W TX! We'll have to mosey on over that way. Thanks for visiting and commenting. I often reply to your comment. Sometimes I'll reply via gmail. My favorite is to visit your blog...leave me a link. 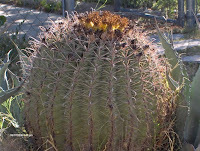 All text, illustrations, charts, photographs, etc., property of Sandra Sue Pittman McPeak,©all rights reserved. BOO-HOO...Pink Saturday I Miss You!